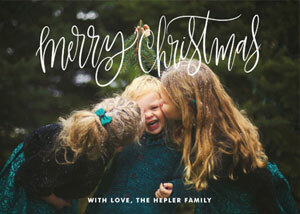 More wonderful letterpress holiday creations, this time from the fabulous Paper Stories. 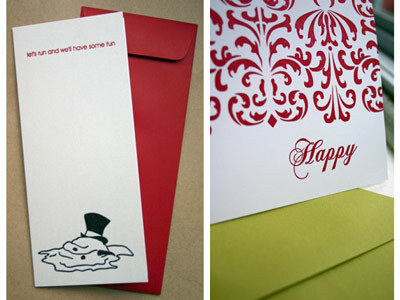 Love the clever melted snowman and the red damask card with the chartreuse envelope. 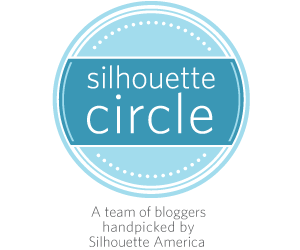 Deep red and chartreuse is one of my favorite holiday color combos. 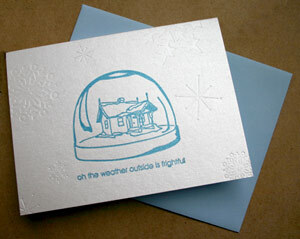 Lovin’ the snowflakes, too, particularly the white on white letterpress on the snow globe card. Great effect! 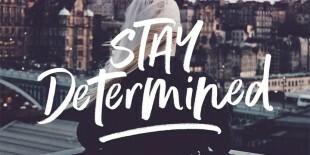 Check out Paper Stories’ collection at paperstories.com, and purchase their letterpress cards from their Etsy shop. 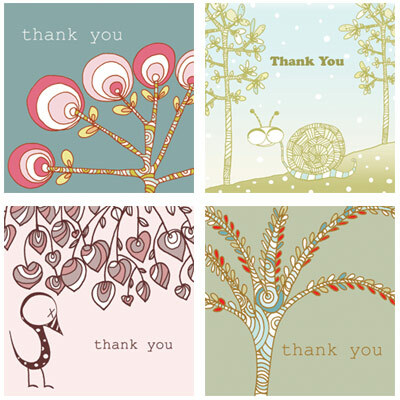 Damask cards are $2.00 each; all other cards shown are $3.00 each. 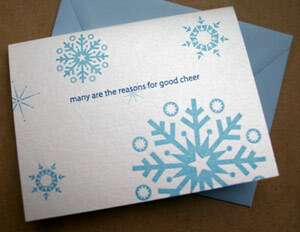 I dig these letterpress printed holiday cards from Carrot & Stick Press. 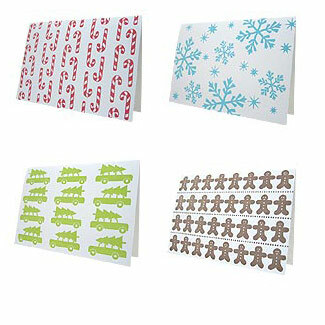 There’s beauty in the simplicity of festive, single colored patterns on a crisp, white background. 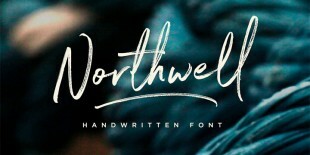 $16.00 per pack of 8 notes and envelopes at Carrot & Stick Press. Every now and then, I come across a line of greeting cards or stationery that completely mesmerizes me, and Red Cap Cards is one of those lines. 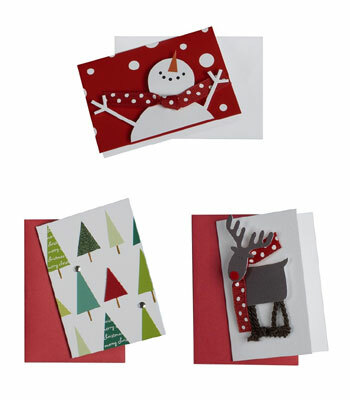 Red Cap Cards was established in 2004 by Carrie Gifford and Hal Mertz and carries both printed and handmade cards. Each handmade card features original artwork by Carrie and is hand torn, hand painted, and individually mounted on a 30% recycled cotton card stock. 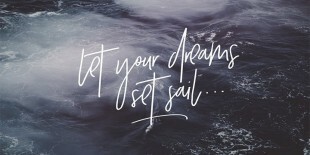 I know that I’d love to buy one of every illustration and frame them as small works of art! I find Red Cap’s illustrations absolutely enchanting in a slightly offbeat way. I was reminded of Edward Gorey, one of my favorite illustrators, when I first saw this line. 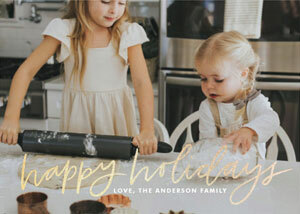 Lovely holiday cards from Pancake & Franks, created in their signature chic, minimalist style. 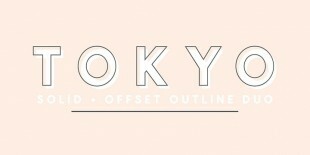 Line drawn images, stylized botanicals, quasi-abstract suggestions of more…it’s all good. 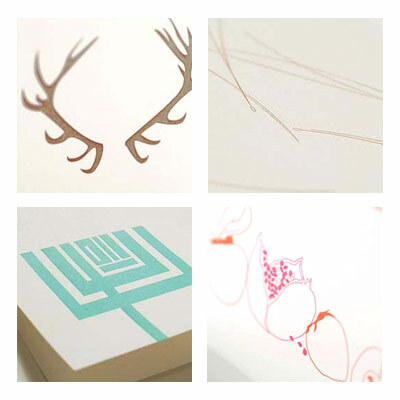 Pictured above (clockwise from top left) are their antler, pine needle, pomegranate, and menorah holiday cards. Yes, this feature is called “A Letterpress Christmas”, but we love all holidays here at Paper Crave and this menorah rocks. 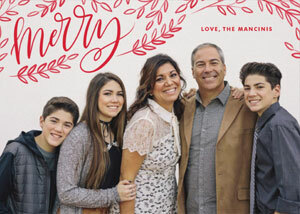 $5.00 per single card and $15.00 per set. 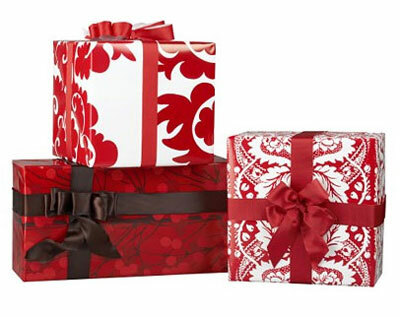 In red: Lumimarja Red Gift Wrap, Samovaari Red Gift Wrap, and Fandango Red Gift Wrap. $7.95 each. 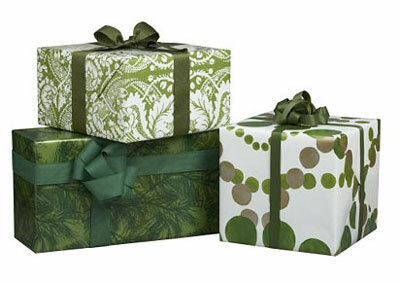 In green: Manty Green Gift Wrap, Fandango Green Gift Wrap, Kastehelmet Green Gift Wrap. $7.95 each. They have some cute enclosure cards, too. Enclosure cards are $1.50 each.